How to Price Match Like a Pro! Gather all of your flyers, and look through them. I find it easiest to circle the deals I want to price match. Sometimes I even go as far as highlighting the size restrictions so that it's easier for the cashier to find. Make your shopping list: I write down everything I am price matching with the price, quantity, where I am price matching from, and which page of the flyer it is so that I can reference it quickly during my check out process. Keep a copy of the store's policy on you at all times. Some cashiers are new and are not familiar with all of their company's policies yet, so it is helpful to keep a copy. Bring your flyers with you. Many stores do require a physical copy of the flyer, however the Walmarts in Moncton will allow you to show the flyer on your smartphone or tablet (which I do). Get the right item. Make sure you read the sale flyer properly. You should have the right brand, size, and flavor if there is a restriction. If there is a limit in the flyer (i.e. limit of 4 per customer), chances are the store you are price matching at will impose the same limits. Sort your items in your cart. I usually separate my price-matched items from my non-price-matched items. This makes it much easier for you and the cashier. If you follow these steps, you will be successful in price-matching at your local store! 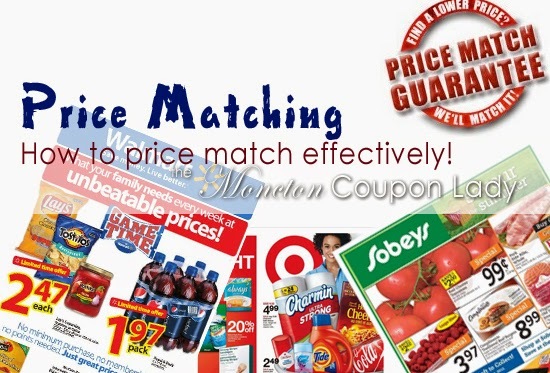 We do the coupon match-ups for you as well, so you can use those as a guideline to creating your shopping lists. Here is a Free Printable Price Matching Tracking Sheet.